The unicorn is a legendary creature that has been described since antiquity as a beast with a single Horn. Kids love playing with UNICORNS as their favorite toy. We have created a fun loving colorful game for our lovely kids. This game is filled with magical adventure with UNICORS in their fairytale land. Go on a trip with your favorite pony into their magical land & get ready to RUN, DASH, JUMP & have FUN in this Fairy Tale Game Adventure. Get upgraded to a powerful UNICORN which can SLIDE, FLY & RUN through the magical fantasy land. If you’re tired you can grab magical hover boards & fly. Surprise!!!!! You can grab all the gifts inside the game & avail exclusive coupons which can be redeemed. 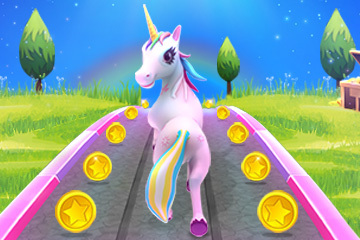 Have fun with the unicorns & their amazing powers in this running game adventure. This is the BEST run game for all UNICORN Lovers! !